We recognize that all our patients are unique and deserve to receive the dental care that reflects their individual needs. This is fundamental to how our practice schedules appointments and works with our patients. Our experienced and talented dental team is committed to working with you and your family to create a comfortable, stress-free, and rewarding dental experience every time you visit our practice. We are pleased to welcome you and your family in our practice and we look forward to working with you. We are happy to introduce you our skilled, friendly, and dedicated team. Kate is our certified Dental Hygienist, who brings experience, focus on quality, and compassion in her approach to dental care, in perfect harmony with the overall practice of dentistry by our team. You can completely trust Kate that she will take good care of your dental hygiene and answer your questions with professionalism and dedication to your dental well being. Kate is a 2009 graduate with an A.A.S. degree in Dental Hygiene from Northern Virginia Community College, with over 10 years of experience as Dental Hygienist, added to 4 more years of experience as Dental Assistant. Jackie is our friendly and experienced receptionist, and has been with the practice since 2008. She is the one who sends you appointment reminders, greets you in our office, and helps you with everything involving insurance coverage. Jackie is a graduate of Annandale High School. In her free time, she enjoys shopping, shows, and spending time with her handsome son, Romeo. Flor will greet you and invite you to your dental chair, take your X-rays, and make sure you are comfortable for your dental procedure with Dr. Nastea and/or our hygienist. 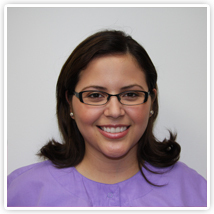 Flor has been with our practice since 2016 and is an excellent, dedicated, and friendly dental assistant.